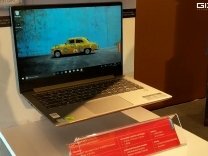 The Lenovo Ideapad 320E 80XL037AIN runs on Windows 10 Home Edition. The laptop features a 15.6 inch,HD LED ,1366x768 Pixels and is powered by a Core i7 7th Gen,2.7 GHz with Turbo Boost Upto 3.5 GHz processor. To enhance multi-tasking and fast speed, the company has offered a 8 GB RAM. Talking about the storage, the laptop uses a 1 TB,5400 RPM (RPM),SATA storage.There is a Bluetooth,Wi-Fi,DVD Writer,USB Type C and more.The laptop has a 2 cell battery that will give enough battery life to the users. Lenovo has launched the company’s latest range of laptops in India. Here’s everything you need to know about it. Lenovo has launched its first 15-inch virtual reality-ready mobile workstation. Dubbed ThinkPad P52, the laptop comes with top-of-the-line features. At the Lenovo Transform event on Tuesday, the company has showcased the concept of a foldable laptop.